Bake your own “house that Ruth built.” Fall and football season are here. I found these cake pans in the shape of a football stadium. A souvenir building collector simply MUST have a building cake for a football or Super Bowl party. 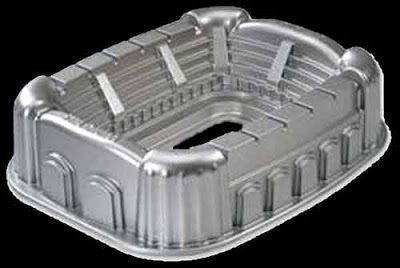 The Nordic Ware Stadium Pan could also work for a soccer, basketball, or hockey team party. Homecoming, Monday Night Football, Little League, the World Series or other events could use a cake like this. Cool Castle Nordic Ware Castle Bundt Pan and Cathedral Nordic Ware 54037 Cathedral Bundt Pan are also available. Sounds like a great idea Donna. Perhaps you'll have some budding architects on your hands also. Would you mind posting the recipe that came with the pan?